Unhook the rubber band and take out the jack. 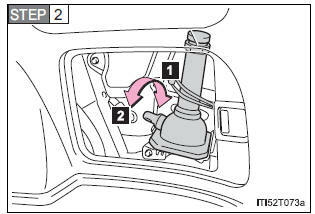 Loosen and remove the jack. Take out the tool box. 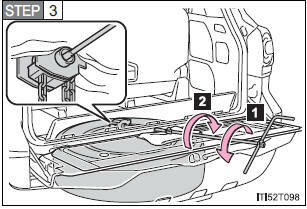 Remove the jack handle and the jack extension bar from the tool box and assemble by following these steps. 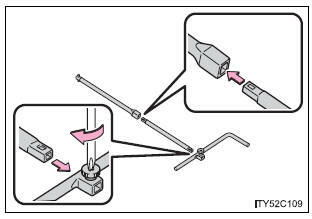 Assemble the jack handle and the jack handle extension bar and tighten the screw. Insert the jack handle extension into the lowering screw. 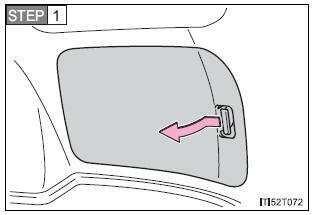 Place a rag under the jack handle extension to protect the back door. 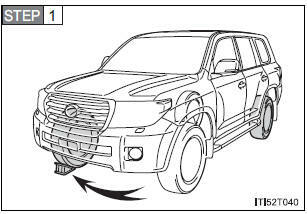 Lower the spare tire completely to the ground. 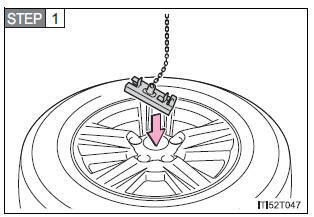 Pull out the spare tire and remove the holding bracket. Pry off the wheel ornament, using the beveled end of the wheel ornament remover as shown. 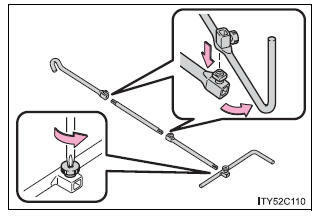 Remove the jack handle, jack extension bar and jack handle bar from the tool box and assemble by following these steps. 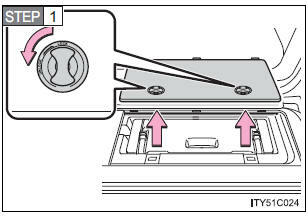 Loosen the bolts and the screw using either the jack handle or a screwdriver. Assemble the jack handle extension bar and the jack handle bar and tighten the bolts. Check that the bolts are firmly tightened. 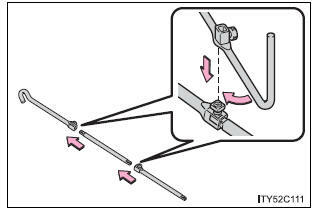 Assemble the jack handle extension bar and the jack handle and tighten the screw. Position the jack at the jack points as shown. 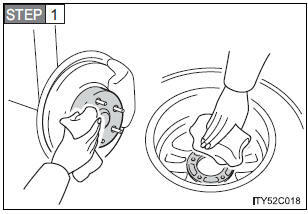 Turn the nut washers until they come into contact with the disc wheel. Lay down the tire with the outer side facing up, and install the holding bracket. 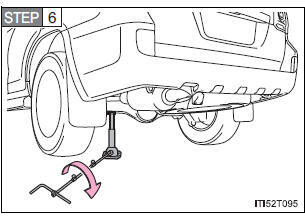 Pull the tire towards the rear of the vehicle when raising. 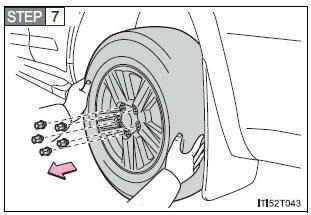 After raising, visually check that tire is not interfering with components. 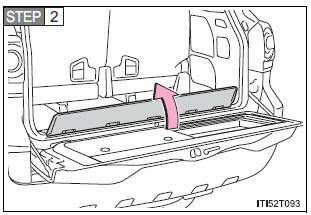 Stow the tools and jack securely, and replace all covers. The tire pressure warning system must be reset. 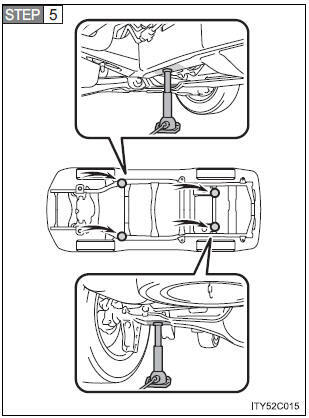 Always check that the tire jack is securely set to the jack point. 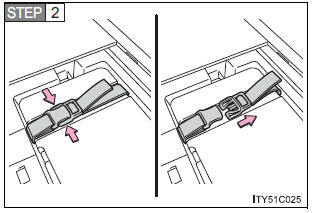 Do not raise the vehicle while someone is in it. 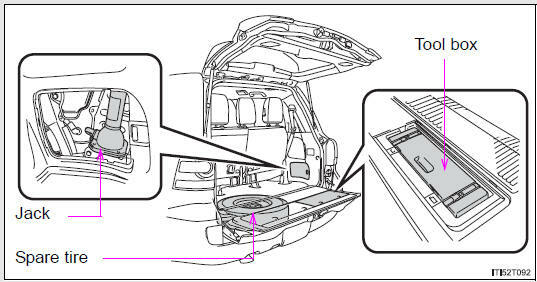 Do not put any part of your body under the vehicle supported by a jack. 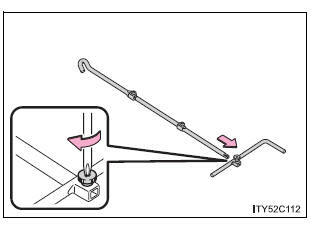 Tighten all the jack handle bolts securely using a Phillips-head screwdriver, to prevent the extension parts from coming apart unexpectedly. 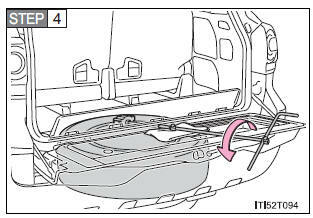 Lower the spare tire completely to the ground before removing it from under the vehicle. Do not try to remove the wheel ornament by hand. Take due care in handling the ornament to avoid unexpected personal injury. 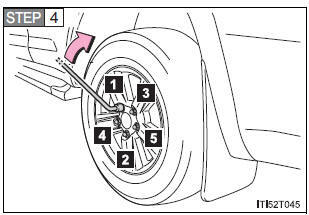 Do not touch the disc wheels or the area around the brakes immediately after the vehicle has been driven. 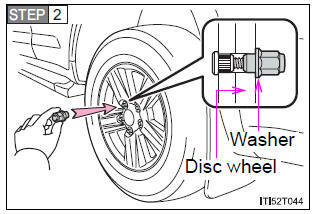 Failure to follow these precautions could cause the wheel nuts to loosen and the tire to fall off, resulting in death or serious injury. 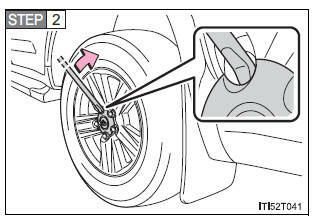 Have the wheel nuts tightened with a torque wrench to 97 ft•lbf (131 N•m, 13.4 kgf•m) as soon as possible after changing wheels. 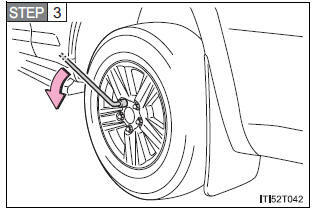 When installing a tire, only use wheel nuts that have been specifically designed for that wheel. If there are any cracks or deformations in the bolt screws, nut threads or bolt holes of the wheel, have the vehicle inspected by your Toyota dealer. 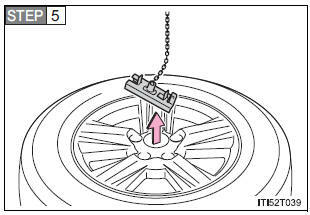 Do not attach a heavily damaged wheel ornament, as it may fly off the wheel while the vehicle is moving. 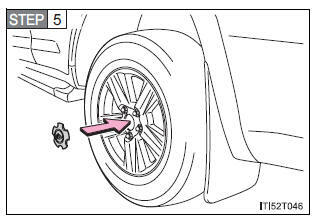 When installing the wheel nuts, be sure to install them with the tapered ends facing inward. 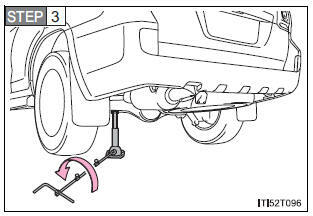 Ensure that there is no object caught between the tire and the vehicle underbody.